And so I began. My very first memory is of hurrying after her as she took me to a pear tree that grew in a pasture next to our first house. Age two. And then a flood of memories followed. I pieced them together chronologically, although they didn’t come in that order. Within the first year I had 70 pages of poems, enough for a book, although I knew that I had not yet gone deeply enough into the difficult years, the decades of my adult life in which it felt like she left me, abdicating the role of mother too soon, and too eagerly. After this initial flood of writing, I worked my way more slowly into the poems. And I found that because each memory came through my perspective, the poems were not simply about my mother moving through the world. T hey were also about myself moving through the world with or without her. They were about how we moved through the world together. And how we moved through the world in separation. They were about our dance. Its moments of harmony and disharmony. Easy concordance and painful discordance. I also found that writing about our togetherness and separation, our harmony and disharmony, our concordance and discordance, was healing for me. I found myself understanding her a bit more. I found myself forgiving her. I found how much I had always loved her and how much I still do. During the past 5 years, I also had dreams about my mother. Dreams in which she was getting in a boat and floating slowly away. In which she was going somewhere that I could not go. I watched for memories to surface and for dreams to come. They seem to come from the same place and in much the same way. Bobbing up to the surface. Too easily forgotten if you aren’t paying attention. Writing them down helps keep them alive. 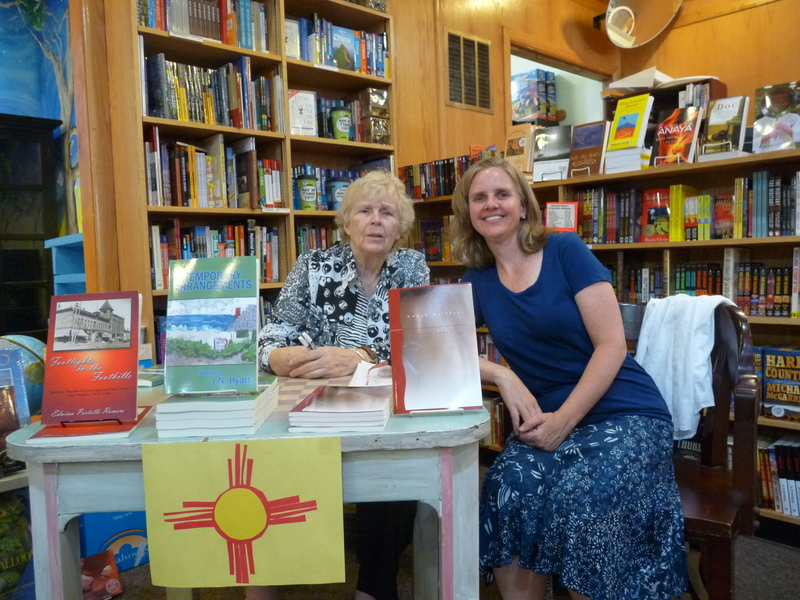 Last year, in June of 2012, shortly after the publication of Under My Skin, my first book of poems, I visited my mother in Las Vegas, New Mexico where she lived. She had just self-published another novel. From the time I was born, she instilled in me a love of reading and of writing. Sharing our literary love was the way we most easily danced together. And realizing that we had not yet done together a mother-daughter reading of our own work, when she suggested she could set one up at her local bookstore, Tome on the Range, I gladly agreed. She talked to a few friends and pulled a writer’s panel together, myself as poet, Mom as fiction writer, and her friend Edwina, a non-fiction writer. At the event, we each spoke about our writing process. And I shared that I had written over 70 pages of poetry about my mother. A friend who knows I am working on these poems and that my mother is also a writer, suggested that I include my mother in the book in some way. Perhaps, my friend suggested, my mother could also write something for the book. With this suggestion, my urgency grew. I phoned my mother and asked her if she would be willing to read the poems and write a response. She said she would very much like to do so. After that, a few weeks hurried past. I had “send poems to Mom” on my ever-expanding to-do list. But it happens in our modern, hectic lives that with every day, more pressing but less important demands take our time and energy, and the needs which our intuition is calling for get postponed and ignored. In fact, there seems to be some internal and external sabotaging force which makes following our intuition doubly hard. Finally in mid November, I emailed the poems to my mother. And she emailed back to say her computer couldn’t open the poems in the format I sent them. She needed me to resend them as a pdf document. I put “send pdf to Mom” on my to-do list. And then Thanksgiving, my December 7th birthday, and Christmas preparations diverted my attention. I sent her the pdf on Christmas Eve. We spoke on the phone on Christmas Day and Mom said she was reading the poems. Between Thanksgiving and my birthday, I had two dreams. In the first, I was in my mother’s apartment, alone, suddenly aware that my mother was dead and that I was to live the rest of my life without a mother. In the second, a large face of a cosmic mother was receding gradually into the stars, while Hermione (from Harry Potter, a young witch, symbolic of wise, creative woman, and a character both my mother and myself identify with) was saying good bye and boarding a space ship for her own journey. “You are precious to me,” she said to the retreating face. On December 29th, my mother emailed to say, “There is some strong writing here. I remember some things differently. I will write my own poems in response.” On the night of January 1st, I went to bed and was woken by a phone call just after midnight. It was my sister, calling to say that my mother’s apartment neighbor had found her struggling to breath, called 911 and on the way to the hospital, her heart stopped. Mom was dead. Looking back, I regret that I dawdled so much in getting these poems to her. If I had gotten them to her sooner, she might have had time to write her response. As it is, will never know what she might have said. I am glad, however, that I got the poems to her in the nick of time. The second to the last poem spoke of my wanting her to die in the way she wanted. To slip away one night and join the spirits of the brown bears and ravens and the infinite stars. I am sure that reading the poems was both painful and healing for her. That she saw me coming to understand her in them. That she found the expressions of love in them. And that she heard, in this second to last poem, me giving her permission to take her exit in the way and the time she needed to. I am left with a feeling that, once she recognized that death’s door was opening, she decided not to hesitate, and chose instead to rush through, impatiently, not wanting to slow down long enough to allow us time to gather at her bedside to say goodbye. Eager instead to find out what was around the corner, the next adventure. And I am grateful for the powerful link – which I can’t explain or describe – between poetry and intuition. Writing poetry has made me a more intuitive person. Being an intuitive person, I have always been drawn to poetry. Poetry is the language closest to the voice of intuition. These years spent writing the mother poems, the dreams sent by intuition, the events of the past year, and the inner urgency to get the poems to my mother, give me now a sense of awe about the poetry-intuition connection. Intuition as the mother of poetry. Poetry as the child of intuition. I will be exploring this link for the rest of my life. And in the end, I have found that by writing the mother poems, I did write about nature, spirituality, the universe, love. The wild sacred mother. The source of all intuition, all dreams, all poetry. The source of all. You are currently browsing the Expressive Art Therapy and Dreamwork with Liza Hyatt weblog archives for February 2013.